Last week (and today) | carpe diem! resulted in several UFOs, mainly work (the first drafts of three information panels went out for comment), but some knitting. Pictures? Ah, yes, I found one. M was so taken by a photo of K’s Kiri in Sea Silk (I’d sent it so she could admire Dyson’s helpfulness) that I’ve started another one for her in blue alpaca/silk. 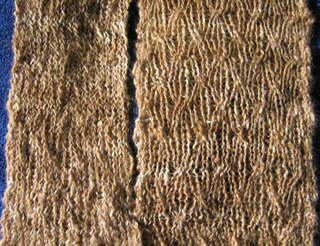 It’s a faster, more pleasant knit than the Sea Silk because the alpaca allows some stretch. 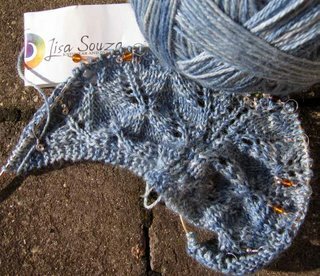 The Lisa Souza yarn is lovely, soft and glossy, and I think the end result will be what I hope for: a large-ish shawl perfect for wrapping up while sitting and reading on chilly evenings, inside or out. I ripped and re-started the Ruby River socks; I couldn’t remember where I was in the pattern, and decided I wanted a different pattern anyway to explore the difference in texture and colour patterning between purl and stockinette. So it’ll be some form of simple ribbing. FO’s include a leaflet that’s finally gone to press and (imagine the sound of trumpets) the Ribble Scarf. It’s finally cold enough to knit wool or, in this case, alpaca/silk. To say I’m pleased with it is an understatement, alas. Fortunately my ego is well-trained and knows better than to make a fuss about this as doing so would irrevocably doom the next project. It was planned as a gift for my new brother-in-law, who is a gentleman. I wanted a pattern appropriate for a gentleman that showed the handspun yarn to full advantage. 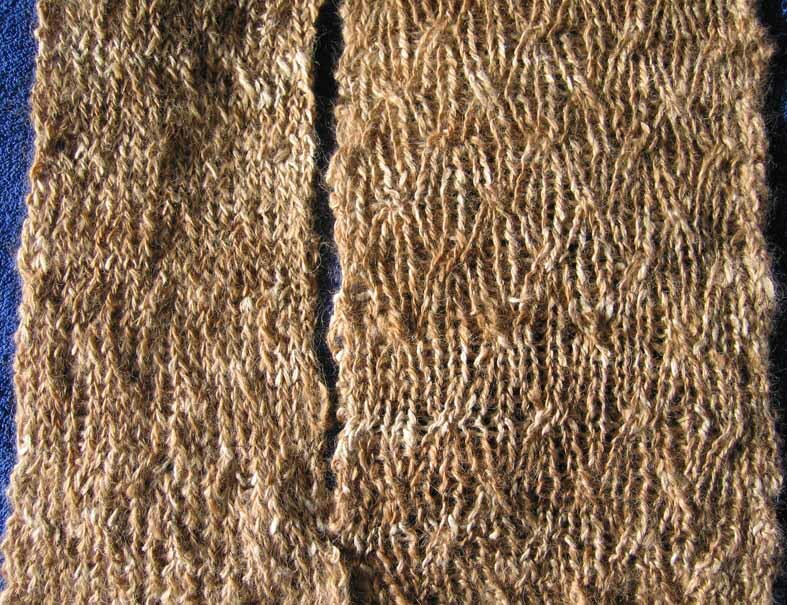 I wanted it to be reversible, not too bulky and, as I realised the handspun alpaca/silk wasn’t elastic enough to make cables or such things ‘pop’, I wanted something with cables that flowed gently across the fabric allowing the silk to catch the light as the fabric moves. I apologise for all that, but it’s the first time I’ve planned and carried out a project with an unknown yarn and I want to remember that those are the factors I consciously considered as I handled the small swatch I’d knitted. The end result is c. 66″ long and 7″ wide, which feels about right for a ‘formal’ scarf. I don’t think this fabric, beautiful as it is, will take a lot of wear without pilling and matting. I envisage it starting life as a scarf he can wear with his greatcoat to work on cold winter mornings; over time, as it ages, with luck it will become a favourite scarf to wear at other times. What an interesting thought: if they have children, he could be wearing that scarf as he takes them tobogganing, teaches them to skate, has snowball fights. That scarf could be my contact with people who don’t yet exist. It’s wonderful. 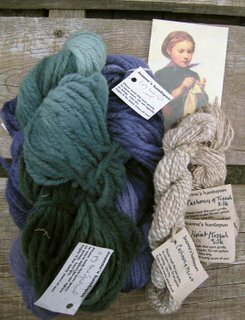 There are 3 skeins, enough for a scarf or a hat, of hand-dyed, handspun 2-ply bulky, 2 in dusk-purple, and 1 in an indescribable green/aqua that together make me think of thunderheads over the prairie in my childhood. And on the right, a skein of cashmere plied with merino and, wonder of wonders, a skein of cashmere plied with tussah and qiviut plied with tussah. Below, from left to right: qiviut plied with tussah, cashmere plied with tussah, cashmere plied with merino. Even my husband knows of qiviut (there was a brief article in New Scientist; alas, they don’t let you see the entire text unless you subscribe). The feel of that skein on my cheek is like a summer breeze. Soft. Warm. Everything smells like real yarn. More importantly, as I hold those skeins, I’m holding something made by a real person. Those lengths of yarn measure hours of Joanne’s life, not just the time needed to dye and spin, but the time needed to acquire those skills. I cherish them. I think there are many, many reasons that ‘the internet’ is wonderful. Some are intellectually satisfying: the vast amount of information available (everything you ever wanted to know about some things, and far more than you want to know about others); the opportunity for information to be free and, through its freedom, to free people. There’s the more self-indulgent option of buying stuff you didn’t know existed from shops that you’ll never visit (some don’t exist anyway, other than as consensual hallucinations between the proprietor and his/her customers. And possibly the income tax people.). It’s changed my life most by offering me the opportunity, via blogs and Usenet, to ‘live’ in communities of people that share my interests and, sometimes, to build new friendships. This entry was posted in Uncategorized on October 5, 2006 by sarahw. 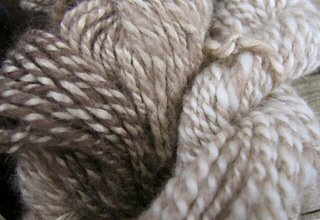 You have a real talent for picking the right yarn to go with the right texture. Your scarf and the beginnings of that blue shawl are amazing! I need something like that for myself too — a thick wrap for an extra layer now that it’s getting chilly out.I often ask myself, what did we do before the internet? It has made us better knitters and hopefully better human beings too. Another reason for liking the Internet: No one can see you blush 🙂 Debby, I think, no, I know you’re right. If it wasn’t for the internet I wouldn’t be knitting now. And I’d never have dreamed I could have friends I’d never know. What amazing photos of the yarn! You took my “hours” and made them art. 🙂 Thank you! The scarf is a pleasure waiting to happen…I’m jealous of the gentleman who will wear such a thing…it will be well-loved.